Chandeliers and dining rooms seem to be made for each other. A grand light fixture is often the perfect centerpiece for these areas in your home. However, choosing just any chandelier won't do. You need the perfect style – and the perfect size. Shopping at local lighting stores is the best way to find the right fixtures for your home. 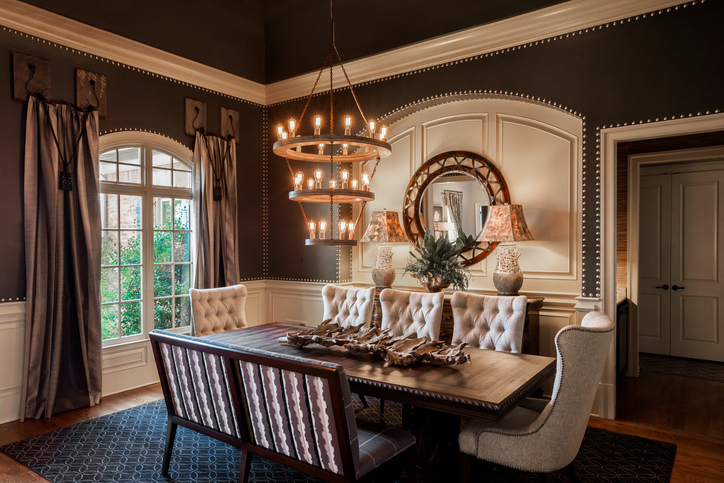 Here are four tips from CESCO on finding the right size chandelier for your dining room. Understand chandelier sizing – Chandelier sizing is based on both diameter and height. In general, typical dining room chandeliers have diameters of between 26" and 30". Measure your ceiling height – Before you buy a light fixture for your dining room, you need to measure the ceiling height of the room. Next, you'll need compare it to different chandelier sizes. Try to have your chandelier hang between 30" and 36" from the table top. Consider the dining table – You'll also want to factor in the size of your dining room table. This is more for aesthetic reasons, since you don't want your chandelier to dominate the room (or vice versa). Look for a chandelier with a diameter that's 1/2 or 2/3 the width of the table. Ask a pro – Finally, if you find you're still having trouble finding the right-sized chandelier, talk to a professional lighting designer at one of your local lighting stores. Our staff can take a look at your measurements and pictures of the room, then help you find the best lighting fixture for that space. Looking for the perfect chandelier for your dining room? Talk to the staff at Carolina Electrical Supply Company. We'll take you around our lighting showroom and help you find the best option for your home.